In appearance the YUGUMOs were almost identical to the KAGEROs, but a modified bridge design to lessen wind resistance and improve stability gave them a more streamlined and handsome appearance. 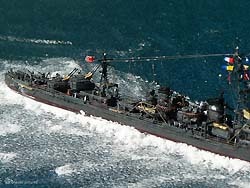 A stronger tripod foremast was incorporated into YUGUMO's design, one capable of mounting the new Types 13 and 22 radar sets coming into service at the same time as the destroyers themselves. Their main armament of six 5"/50 cal. guns was the same as the KAGEROs, but these were mounted in the new Type D turret capable of 75-degree elevations as opposed to KAGERO's 55-degrees, a considerable advantage in the antiaircraft role which became more vital as the war progressed. 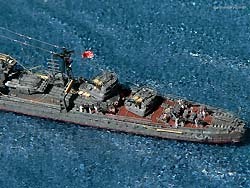 In fact, this major upgrade, often overlooked, obviated the need to sacrifice a main-gun turret for extra light AA, and no YUGUMOs actually suffered the removal of their "X" turret to make room for extra 25 mm. machine guns, as has been widely reported. 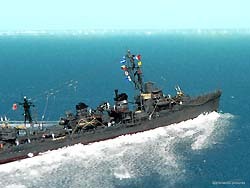 (SHIMAKAZE also carried the Type D turrets ・KAGERO-class AKIGUMO did not.) Instead, surviving YUGUMOs added their two triple 25 mm. mounts on bandstands abaft their fore-funnels. 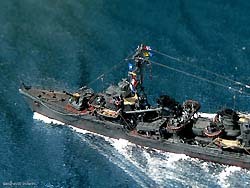 One of the spare sets of Long-Lance torpedoes was also eventually landed in favor of the greater AA firepower, with the total number of 25 mm. growing to between fifteen and twenty-eight per destroyer. 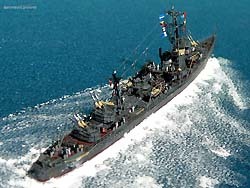 In performing their duties the ships of the YUGUMO class paid the full price, all nineteen being lost during the war. 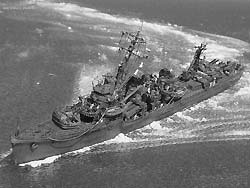 The ever-greater threat from U.S. air power during that war was reflected in these losses: ten YUGUMOs ・over half of the class ・were destroyed in air attacks (including KIYOSHIMO, finished off by a PT-boat) while only four perished in the surface actions for which they were primarily designed. 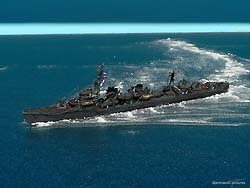 Submarines accounted for four more and a mine one. 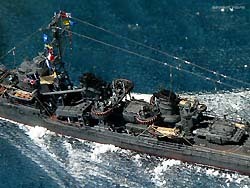 Most shockingly, at least five YUGUMOs were lost with their entire crews, underscoring both the unforgiving nature of the conditions in which they fought, and the vulnerability of even this most advanced of Japanese destroyer designs. ship horse power: 52,000 shp. The building of the model kit was mostly straight forward as the quality of the Pit Road models is high. 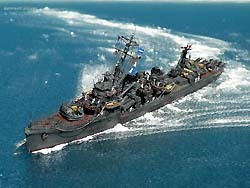 But I have to modify the superstructure of the ship to right length. 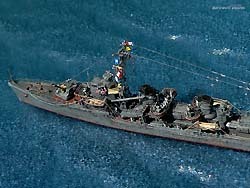 This error from Pit Road is probably because some of the kit spurs also will be in the Kagero-class (Yugumo-class destroyers have their superstructures to overhang the deck below in front the forward stack. (This is a minor problem easy to solve by adding Styrene plastic and some putty and sanding). 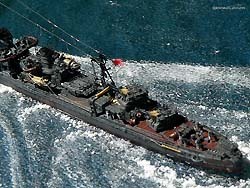 The masts were totally rebuild as the parts are to "heavy" in this scale. 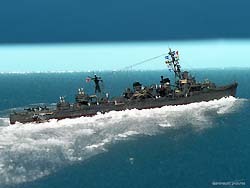 Asashimo had a slightly different forward mast than the shape in the kit, so this also helped to show the model in a higher realism. 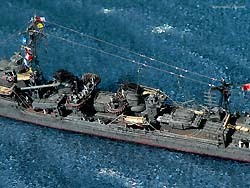 The Yugumo class of ships are different in the shape of the supports under their AA gun platforms. So with the help of some surplus PE-set, this little item now looks as on the pic. of the real ship. I often use PE-set's for the davits, but here I have made the forward pair of 0.4 mm silver tread and the rear pair is from the kit itself, but sanded down to a more acceptable thickness. 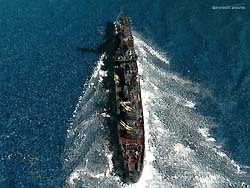 My model show the ship in the last sortie to Okinawa were Asashimo escorted the super battle ship Yamato in the frantic suicide mission on Apr. 7. 1945 - To upgrade the ship in "1945 mode" I added extra 25mm AA guns as well as the latest Radars and anti splinter ropes etc. Pit Road has not included the decal of the Chrysantemum -logo on the forward funnel - But luckily I had a spare pair from Pit Road Submarine decal sheet. 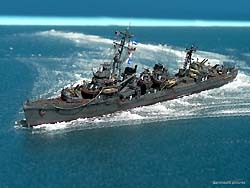 The extra parts that I scrach build for the ship is also steel plating in front of the single 25mm AA guns (Surplus from the PE-set's ex. between the ladders ;-)). 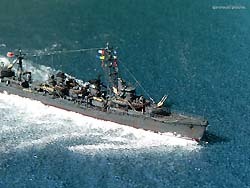 The only known signal flag code (call signs) to the Yugumo-class destroyers are from Fujinami = J Z E A Asashimo own code are "found by me" by interpolate the code following the date the individual ships were commissioned ( Fujinama + 3 = J Z E A + 3 = J Z H A). If you have additional information about this subject, I will be glad to hear from you ! 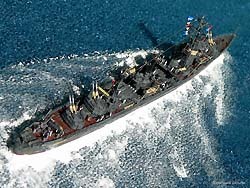 All in all a fine little model kit, that will show the evolution in the Destroyer section of my glass cabinet as well as on this site. 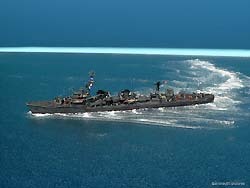 + few extra parts from "The surplus storeroom"
Japanese Naval Warship Photo Album Destroyers from Diamond Sha books. The building time was 12 days. If you have any questions, remarks or things you will share, please don't hesitate to contact me.